Aqueous solubility is one of the most important physico-chemical properties in modern drug discovery. It has impact on ADME-related properties like drug uptake, distribution and even oral bioavailability. Solubility can also be a relevant descriptor for property-based computational screening methods in the drug discovery process. Hence there is a significant interest in fast, reliable, structure-based methods for predicting aqueous solubility of promising drug candidates. 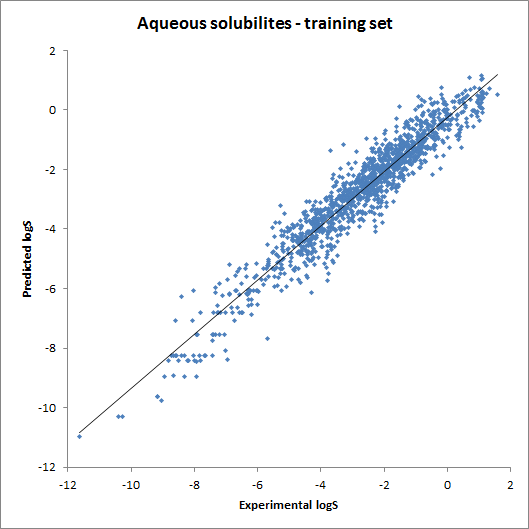 Predicting solubility for drug molecules is not a trivial computational task. The used model has to somehow calculate the intrinsic solubility for the compound, which is a crucial solubility parameter. ChemAxon's Solubility Predictor is able to calculate the intrinsic aqueous solubility. The prediction uses a fragment-based method that identifies different structural fragments in the molecule and calculates their solubility contribution. The implementation is based on the article of Hou et al . The figure below shows a fragmented molecule using the fragmentation method behind the intrinsic solubility prediction. Fig. 1 The molecule is split into fragments to predict its solubility. However, in many applications (such as therapeutic or lab measurements) it is also important to know the solubility in acidic/basic solutions, that is at a given pH. 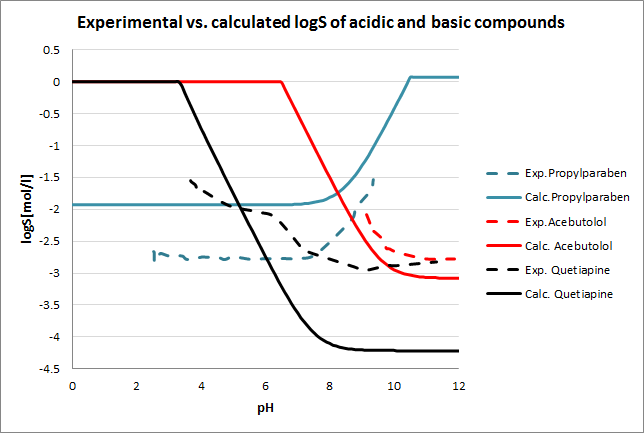 Therefore the model should also be able to calculate the pH--solubility profile of a compound. The original solubility predictor method has been extended so that it is able to calculate the pH--solubility profile. 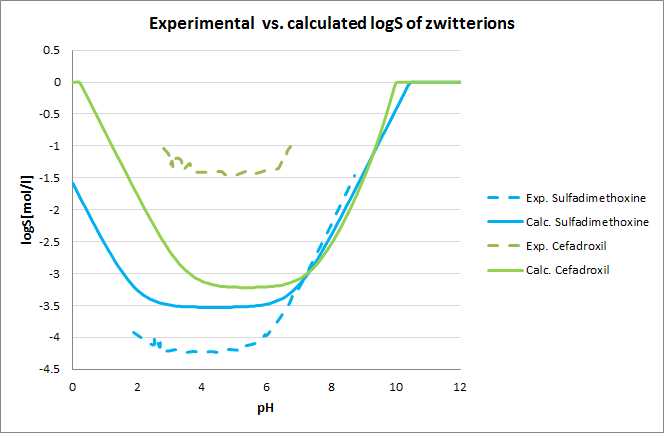 The predictor can provide quantitative results, giving the solubility in logS, mg/mL or mol/L units. The predictive accuracy of the plugin is considered to be 1 logS unit. In case only an estimation about how well the compound is soluble, the plugin can give a solubility category as a qualitative measure. The logS is a common unit for expressing solubility. This unit is the 10-based logarithm of the solubility measured in mol/l unit, that is logS = log (solubility measured in mol/l). The accuracy of the intrinsic solubility prediction was tested using two test sets in Hou et al. 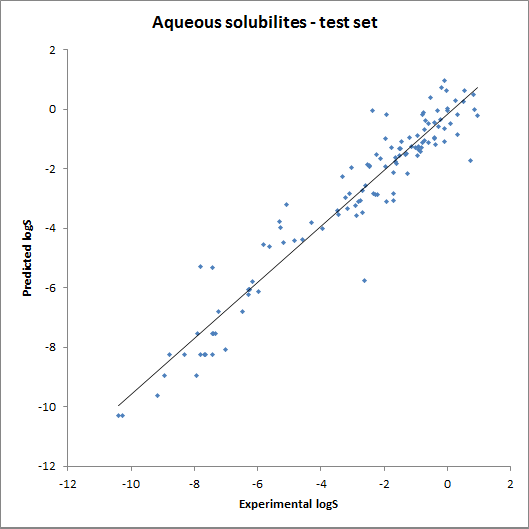 The two plots below show the experimental vs. predicted intrinsic solubility values and the deviation. Tests for pH--logS profile were also run. The two plots below show calculated and experimental pH-logS profiles for different acidic, basic and zwitter-ionic compounds. The Solubility Predictor will be developed further in the future. Among our future goals we have extending the prediction with a descriptor-based method and adding training features. The Solubility Predictor is currently available in three ways. The solubility predictor is integrated into Marvin Sketch as a plugin, which makes prediction fast and easy. 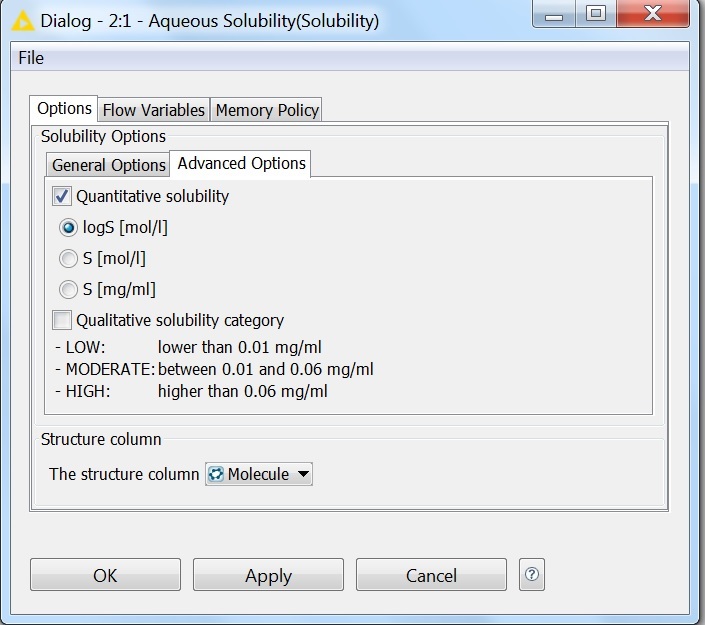 The Solubility Plugin can be reached via the Calculations > Solubility > Aqueous Solubility menu item. 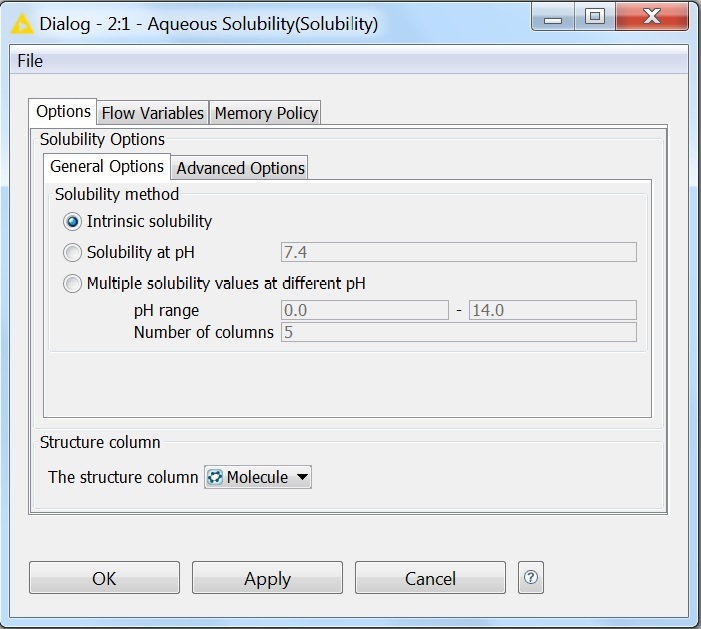 The menu system of the Solubility Plugin has File, Options and Help menu items. The File menu can be used to export the results into PDF, or to close the result window. Export to PDF: exports the results into a PDF file, which can be used as a report. Exit: closes the result window. The Options menu can be used to set the options of the solubility calculation. Measurement Unit: sets the solubility measurement unit. This can be logS (default), mol/l, or mg/ml. Restore default settings: restores the default settings of the calculation. The Help menu opens the help guide of the predictor. These categories are determined based on intrinsic solubility values. pH-Solubility table: displays a table containing the predicted pH-solubility values. A unit parameter, which could be 'mg/ml', 'mol/l', 'logS', or 'category'. In case of 'category' is used, qualitative solubility is calculated. If no unit parameter is given, logS unit is used. A pH parameter, which is a real number (e.g. '7.4') and sets the pH for solublity calculation. If no pH parameter is given, intrinsic solubility is calculated. 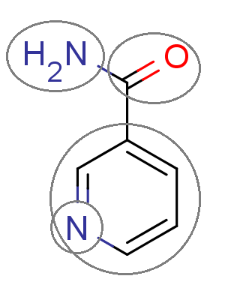 In this workflow the importer node provides the molecules for the solubility node. The solubility node is set to calculate the intrinsic qualitative and quantitative solubility for the input molecules. 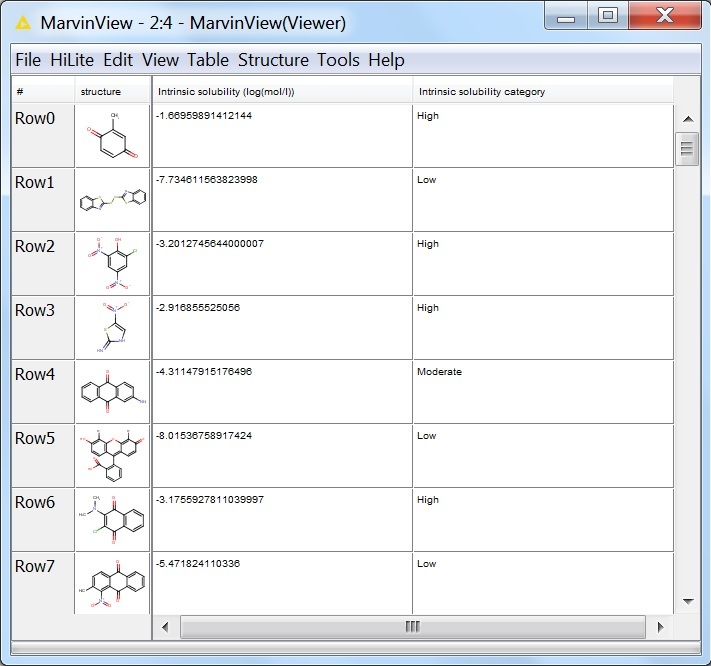 The output in this case is a MarvinView node that is used to view the molecules with the calculated solubility values. The picture above shows the state of the nodes before the running of the whole workflow. The Solubility Plugin API with usage examples can be reached here. 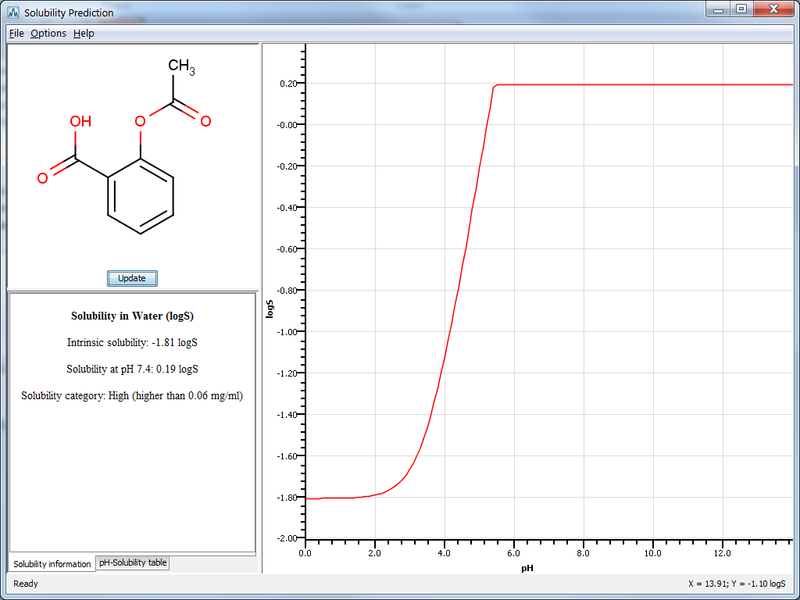 You can try the Solubility Predictor for free on this demo page.